Six years after the 2008 financial crisis, the world is still struggling to return to normal. Extraordinary monetary stimulus is still needed to support growth in many developed countries and economic activity has yet to return to pre-crisis levels. It seemed at the beginning of this year that 2014 would be the year in which the global economy would move onto a higher, self-sustaining growth path. Fiscal policy in the United States, the United Kingdom and Europe had moved toward neutral after a period of austerity and monetary expansion, and hopes for an uptick in business investment were high. Then growth in Europe and the emerging markets disappointed, and an ill-advised tax hike stopped Japan's recovery in its tracks. After mid-year the outlook for growth became even more clouded as oil prices fell by more than 40%. At first the market thought lower oil prices would act as a tax cut for consumers and boost aggregate demand. In recent weeks, however, markets have had second thoughts, with growing concern that plummeting oil prices may be a sign that the global economy is headed for a downturn once again. Will 2015 be the year in which growth finally responds to the massive monetary easing of the past few years, allowing central banks to step off the gas pedal? Or will it be yet another year of sluggish economic activity? The investment implications of the two outcomes are profoundly different. In what follows we review 15 items that have been critical to shaping our views on the global economy and the markets in 2015. Some are consensus forecasts, others are risk factors. As the year progresses we will be monitoring these items to see if events are playing out as we had envisaged, or whether a mid-course adjustment is necessary. The best starting point for developing an outlook for the markets in the year ahead is always a GDP forecast. 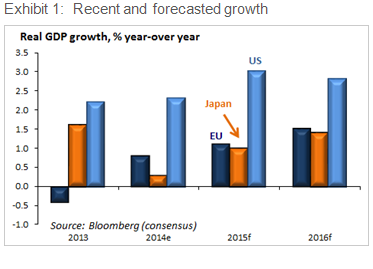 The consensus among economists surveyed by Bloomberg is fairly sanguine: They expect real GDP growth to pick up in 2015 and 2016 in the United States, Europe and Japan (Exhibit 1). Our view is a bit more cautious, but not that far from the consensus. We expect that growth in the United States, while still not as robust as in previous recoveries, will be strong enough to allow the Fed to raise interest rates for the first time since 2006. The decline in oil prices will be, on net, positive for U.S. GDP growth, and for growth in Europe and Japan as well, in our view. Quantitative easing in Europe and Japan, meanwhile, should allow those economies to avoid a downturn. The United Kingdom is already on a solid footing for higher growth. Oil-producing nations such as Russia and Venezuela will suffer from the decline in oil prices, but we expect emerging economies such as Brazil, India and China to benefit from the stronger growth in the developed world. Any shortfalls in realized growth from these forecasts would warrant a more conservative investment policy, with a move out of riskier assets. Extraordinary monetary easing in the developed countries has raised fears in some quarters that high inflation would be the result. 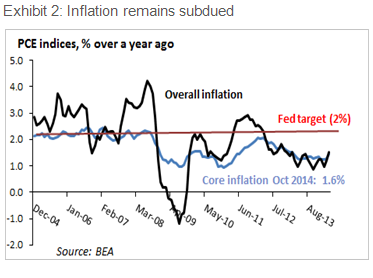 Now, with inflation nearing zero in many countries, deflation is emerging as the greater concern. High debt burdens, slow growth, and now falling commodity prices have all played a role in suppressing inflation in Europe and Japan. In the United States deflation seems unlikely, but several factors are likely to keep inflation low for several more quarters. First, considerable slack still exists in the economy. Despite the decline in the unemployment rate to 5.8%, real GDP is still 3.4% below its long-term potential as estimated by the Congressional budget office. Second, wage growth remains lower than is usually the case at this stage of the business cycle. 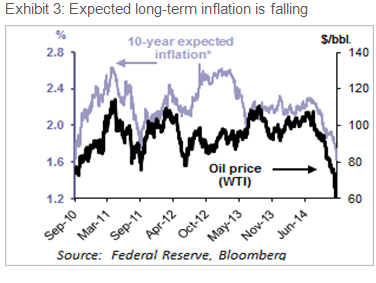 Third is the decline in oil prices which should affect consumer prices directly, but also are leading to reduced long-term inflation expectations (Exhibit 3). Since the end of the financial crisis central banks first in the United States and the United Kingdom and more recently in Japan have been engaged in quantitative easing in an effort to stimulate their economies. The European Central Bank (ECB) has belatedly taken extraordinary measures to ease monetary conditions and is expected to start quantitative easing in 2015. The unusual easing was deemed necessary in the face of weak private demand and budget tightening in most of the developed world. With GDP growth expected to pick up in 2015 and governments moving toward neutral fiscal policies, central banks in the United States, Canada, and the United Kingdom will be starting to move away from monetary easing. 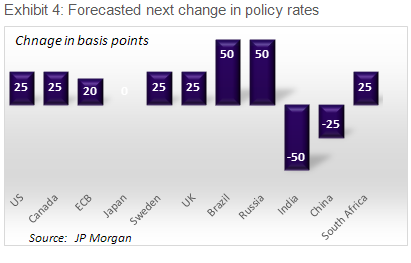 JP Morgan's economists expect the next move in policy rates will be up in most developed countries, though the ECB is not expected to raise policy rates until 2017 and the Bank of Japan is forecasted to remain on hold indefinitely. Countries with current account deficits and subject to capital outflows, such as Brazil and Russia will be out of phase with the developed world "both have already hiked interest rates. On a trade-weighted basis the US dollar has risen by 9.7% so far this year. That move has taken few observers by surprise because policymakers in Europe and Japan have been seeking to engineer a decline in their currencies as a way to stimulate exports and jump start their economies. The rise in the dollar is good news for U.S. consumers, who will find imported goods less expensive. It is not terribly welcome news for U.S. exporters, whose goods are now less competitive in foreign markets. 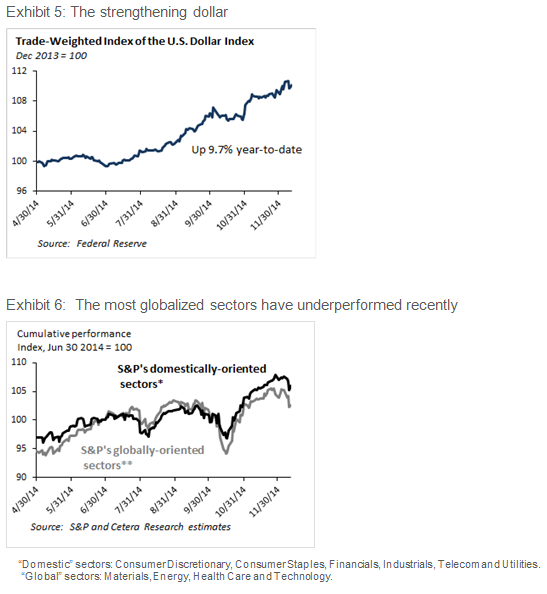 The rise in the dollar has already had an impact on the relative performance of those sectors of the economy that generate more than half of their revenues from overseas sales: Energy, Technology, Materials, and (surprisingly) Health Care (Exhibit 6). Currency movements, however, need not be a zero-sum game. Eventually the stronger economies that result from more competitive export sectors in Europe and Japan will start to import more, helping U.S. exporters. Expectations about economic growth and changes in monetary conditions are reflected almost immediately in the futures markets for policy rates. Those markets are currently pricing in expectations that growth will be stronger and a move toward higher policy rates will come sooner in the United States than in the Eurozone and Japan. Expectations about the future course of U.S. interest rates are also reflected, although less clearly, in the shape of the yield curve for government securities. 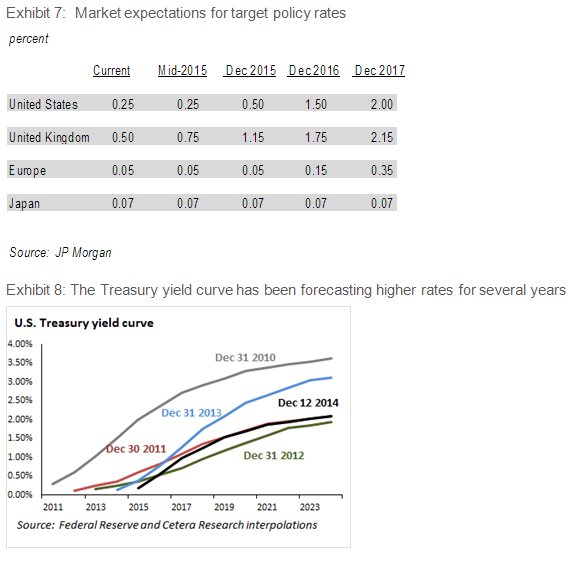 In the United States, in addition to the current positive yield premium built in, the U.S. Treasury yield curve has been upward sloping and therefore implicitly forecasting a rise in future interest rates for several years (Exhibit 8). In fact, despite numerous recent signs of a strengthening of the U.S. economy the Treasury yield curve is not as steep now as it was just a year ago. If interest rates do rise, bond prices will, of course, fall, with the steepest declines occurring on long-duration bonds. The damage from the rise in interest rates, however, should be tolerable unless growth accelerates or inflation rises by more than the market is currently pricing in. Under those circumstances the Fed would raise rates faster than the futures and yield curve are pricing in, and the pain will be much greater. One of the most often-heard criticisms about the Fed's quantitative easing has been that the massive amount of liquidity provided by those programs has not resulted in an easing of credit conditions. To be sure, much of that liquidity has wound up in record-high holdings of excess reserves by banks. Rates on business loans and home mortgages have declined, but anecdotes have been plentiful about how hard it was for borrowers to get loans. 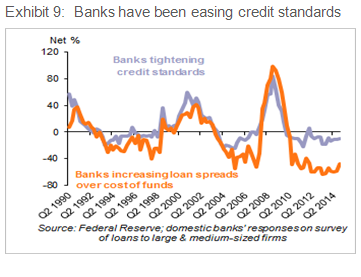 Banks, eager to rebuild their balance sheets after the financial crisis and recession, initially did tighten credit standards markedly. But since the first quarter of 2010 banks have reported that they have been easing the non-rate terms of business loans (Exhibit 9). Banks report that they have been easing the terms of traditional mortgages as well. The easing of credit conditions does not, however, mean that liquidity for businesses is ample. In the Fed's most recent survey large banks reported that liquidity positions of 23.5% of business owners were either somewhat tighter or at the tightest level they have been during the reporting period. Spreads on corporate and emerging market bonds widened during the financial crisis and recession, but have been declining on trend in the past four years, helping boost returns in those asset classes. 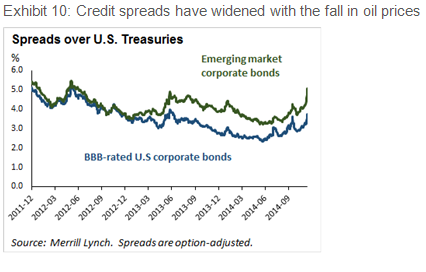 In recent weeks, however, spreads on corporate and emerging market bonds have widened sharply. The widening was led by high-yield bonds issued by energy companies, whose spreads went from around 400 basis points over U.S. Treasuries in July of this year to 850 basis points today, but has now spread to other sectors of the corporate market. The widening of spreads in the high-yield market should not be too surprising, given that earlier this year it was an issuers' market and the bonds were priced for perfection, making them vulnerable to any news about an increase in risk. The widening of spreads in the non-energy segment of the corporate and emerging bond market does not, in our view, represent a signal to sell. Non-energy spread product should perform well if, as we expect, the U.S. economy continues to grow. Memories are still fresh of the gridlock that characterized debates between Congress and the White House about fiscal policy in recent years, including the government shutdown in the summer of 2011 and the fiscal cliff that threatened another shutdown in January 2013. The market's reaction to the political uncertainty was decidedly negative. Since the 2014 mid-term elections a new tone seems to have emerged in Washington. The passage by Congress on December 11 of a $1.1 trillion spending bill has raised hopes that a bipartisan compromise may replace gridlock as the new norm. 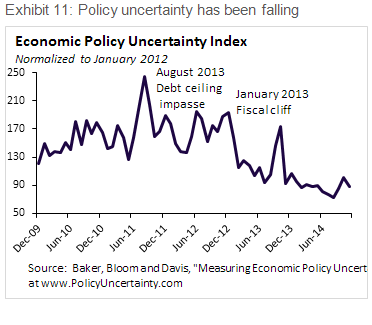 An index of economic policy uncertainty created by economists Scott Baker, Nick Bloom, and Steven Davis based on a word search of newspapers, the timing of tax code expirations, and measures of disagreement among economic forecasters indicate that such uncertainty has been falling on trend since the dispute about the debt ceilings in summer 2011 and early 2013. It is a truism in investing that the stock market must always climb a wall of worry. This year has not lacked geopolitical events that threatened market stability, including Russia's annexation of Crimea and support of Ukrainian separatists, the conflict in Gaza, and the rise of ISIS. Yet the stock market managed to shrug off the news of turmoil from abroad, with the S&P 500 up 9.2% for the year as of this writing despite a pullback since early December. 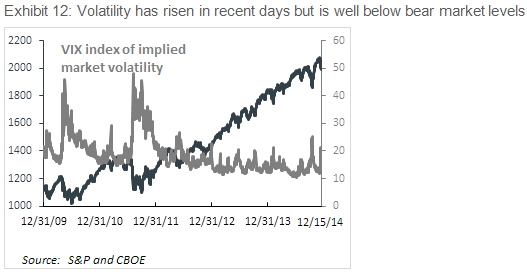 In doing so the stock market has behaved as it usually does in the face of geopolitical risks. Historically, the market has fallen initially on news of an event that portends rising risks, but has recovered quickly unless the event leads to a multi-year, multi-country conflict. The stock market usually recovers within a few day of news of a terrorist attack, for example, but may take years to reach its previous high following events such as the attack on Pearl Harbor or North Korea's 1950 attack on South Korea. The market's judgment " so far at least " seems to be that the geopolitical events of the past year are unlikely to lead to wider conflicts. After spending most of the year below its historical average of 19, the VIX index of expected future stock market volatility implied by options prices jumped above 20 on December 11 and went on to close at over 23 three trading days later. That is a level that signals some concern about the possibility of a weaker market going forward, but it is well below the 40-plus levels registered in full-blown bear markets. The timing of the recent rise in the VIX coincides with the sharp slide in oil prices, and doubtless reflects the uncertainty felt in the market about the extent to which low oil prices are signaling that the global economy is weaker than expected. A decline in the VIX from current levels can be interpreted as a sign that the market has concluded that concerns about weaker growth and a weaker market have been overblown. Bull markets tend to go on for a long term " usually until Fed tightening or a financial crisis put them to an end. 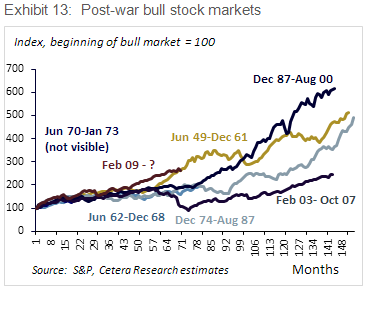 Defining a bull market as a rise of at least 50% from the bottom of a bear market, and a bear market as a decline in stock prices of at least 20% that lasted at least three months, six bull markets have occurred since the end of World War II (excluding the current one). The average duration of these markets has been eight years and eight months; the one we are in now has so far lasted five years and nine months " not long in historical perspective. 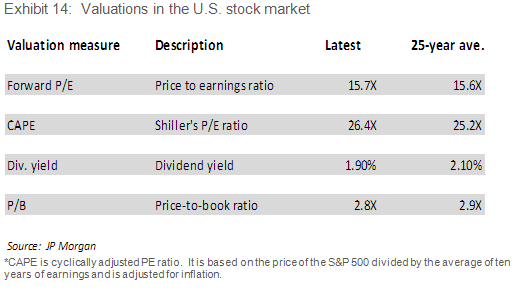 Despite the long rise in prices since February 2009, valuations in the U.S. stock market do not appear stretched. As can be seen in Exhibit 14, most standard valuation metrics are near their 25-year averages, suggesting that this market has more room to rise before lofty valuations become a concern. The stock market's obsession with earnings is well-founded: Over time, earnings growth and stock price movements tend to track one another. Earnings and profit margins in the U.S. corporate sector are at an all-time high, so the near-record levels of the major stock market indices should be no puzzle. The strong earnings performance of U.S. corporations has been remarkable especially in that it has been achieved during a period of sub-par global growth. The consensus among analysts is that earnings per share for the companies in the S&P 500 Index will grow 13.7% in 2015 on top of the 10.8% growth this year. Equity analysts tend to revise their estimates downward as the year progresses, but unless their 2015 estimates have been especially optimistic, earnings should again serve as a strong source of support for the market in the coming year. 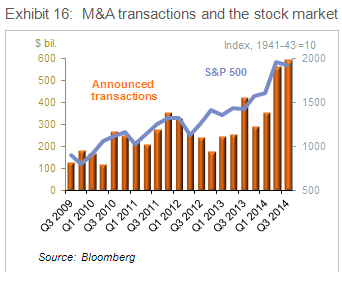 Announced M&A deals have risen to their highest level since before the 2008 crisis, helping boost the stock market. Acquisitions are often substitutes for in-house capital expenditures, so a rise in M&A activity is a sign that business investment generally is on the rise. 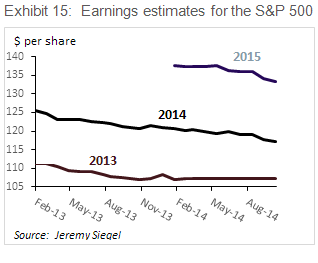 Corporate stock buybacks, however, are down this year. The most likely reason is that with stock valuations well off their recession lows, firms are finding investing in plant and equipment offers a higher return than repurchasing their shares. Historically the U.S. business cycle has been led by housing. The U.S. housing market continues to recover " slowly â€“ helped by lower mortgage rates and a gradual easing of credit terms. Affordability, however, has actually declined in the past two years, reflecting slow growth in incomes, though the median family is still more than able to afford the median priced house (a value of 100 on the Affordability Index). 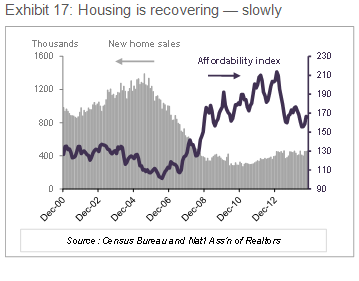 It will be many quarters before housing can be described as booming, but house prices are rising rapidly in many cities. While the prices of several key commodities have fallen this year, none has captured the attention of investors and consumers as much as the recent decline in the price of oil, which has fallen about 50% since late June. Three factors are behind the fall in the price of oil. One is structural: As a result of conservation efforts and more efficient technology, the Unites States uses less than half as much oil to produce $1,000 of GDP as it did in 1970. Gasoline consumption in the United States is on a downward trajectory. Another factor is the huge increase in supply resulting from fracking and other technologies that have raised U.S. energy production. Globally, oil production has surged 4.5 million barrels per day since 2007 and is up 1.3 million barrels per day this year alone. Third, global demand has fallen because of slow growth in Europe and especially in the emerging markets. The decision of OPEC to not increase production suggests that oil prices will remain low for some time to come. While the markets appear to have had some difficulty in digesting the implications of lower commodity prices for growth, the view of JP Morgan's analysts, which we share, is that on net the result will result in an increase in U.S. GDP growth of between 0.1% and 0.4%. The boost to global GDP growth is likely to be even higher, perhaps as much as 0.6%. The principal winners will be consumers, for whom the lower energy prices are comparable to a tax cut. Capital spending in the energy sector will take a hit, but the decline will not be as large as the boost in consumer spending. Oil importing countries such as Japan and Taiwan will be clear beneficiaries of the lower prices, while oil producing countries such as Russia and Venezuela that obtain the lion's share of their government revenues will be losers. 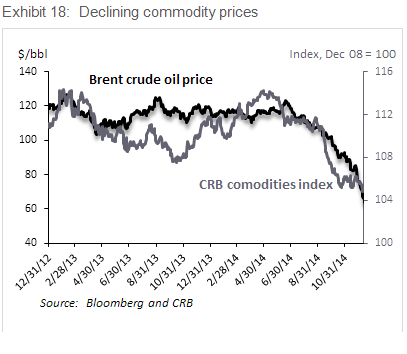 A stabilization of oil prices near current levels would be greeted favorably by the markets, in our view. Taking the 15 items we have highlighted into account, we would summarize the outlook for 2015 as follows: Growth in the United States, while still not as robust as in previous recoveries, will be strong enough to allow the Fed to raise interest rates for the first time since 2006. The decline in oil prices will be, on net, positive for GDP growth in the United States, and in Europe and Japan as well. Quantitative easing in Europe and Japan should allow those economies to avoid a downturn. The United Kingdom is already on a solid footing for higher growth. Oil-producing nations such as Russia and Venezuela will suffer from the decline in oil prices, while oil-dependent nations in Asia will benefit. In this environment we continue to maintain an allocation to equities based on long-term investment objectives. In other words, we would be overly aggressive or overly conservative in equity allocations. We favor domestic equities, especially large cap stocks that should be in a better position to weather any shocks that may occur in the year ahead. With that said, we have started to become optimistic about the prospects of small cap stocks given their relative underperformance to large caps in 2014, their economic sensitivity and, because they tend to derive less revenues from foreign economies, would likely be less impacted by a strengthening dollar. Regarding equity sectors, we continue to maintain a modest overweighting in growth stocks, mainly because they exclude concentrations in sectors such as utilities that are sensitive to interest rates and thus vulnerable to any upside surprises in growth. In international stocks, we are slightly overweight developed Europe and have a slight underweight to emerging economies. We are slightly underweight commodities, which could come off their lows if the global economy picks up. However, they do face tough headwinds in the form of a stronger dollar and excess supply. With the prospect growing of higher interest rates in 2015, we recommend an essentially defensive position in fixed income, which means overweighting bonds that offer a yield spread over Treasuries (such as corporate and international bonds with a higher investment grade) and have positioned overall portfolio interest rate sensitivity to be below that of the benchmark. We believe it makes sense to retain an allocation to alternative investments due to their low correlation to traditional investments. Finally, from a portfolio implementation standpoint, we prefer managers with flexible investment styles allowing them to have the discretion and ability to move nimbly in the face of changing circumstances that we anticipate in the year ahead.